IoT devices are everywhere, from Industry 4.0 to Smart City projects. Developers of IoT applications deserve the same agility and cloud hosting ease than web developers. That’s why we unveil today the TCP Gateway addon to make IoT applications first class citizens on Scalingo. Let’s see how you can benefit from this. The majority of Platform as a Service providers are limited to web applications hosting, reachable via the HTTP protocol. However, in memory, CPU and battery constrained environment, like in the IoT world, folks don’t always use HTTP. Usually a custom, fast and lightweight TCP based protocol is preferred. When you think about it, the application “BUILD” and “RUN” stages are very similar from those of a web application. Programming languages (NodeJS especially) and databases are usually shared as well. Therefore, the only limiting factor for a PaaS to host IoT apps is to have a TCP Gateway. We explained earlier how this feature can be achieved technically. Today, we are unveiling the TCP Gateway addon which is the concretization of the previous technical article. That makes IoT apps, and of course any TCP based apps, first class citizens on Scalingo. Let’s go deeper in the procedure. First, create your app. The wizard will guide you through a few steps. Give it a name and select the TCP Gateway addon. Before pushing your code, you need to define a tcp line in your Procfile, it instructs the platform which process will handle the TCP traffic. The Procfile is a simple text file defining one or several types of process (one per line). For HTTP/HTTPS protocols, the web line describes the process handling incoming web requests. For the TCP protocol, the tcp line is responsible to start the process responsible to receive TCP connections. As usual on Scalingo, the programming language you’re using will be automagically detected. Once the TCP Gateway addon has been provisionned, it will automatically inject a TCP_URL environment variable in your app context. The variable is shaped like: tcp://tcp-gateway-1.eu-fr-agora-1.scalingo.com:20000. This is the TCP endpoint to contact yoru app. While we advise you to read the complete technical documentation about the TCP Gateway addon there are 3 main topics that you should be aware of. TCP connections are load balanced to application containers via NAT. The consequence is that the source IP address is replaced by our front end servers internal IP. Thus, the device identification must be intrinsically integrated in the protocol you designed over TCP. The impossibility of identifying the source IP address is a limitation of our current software architecture. It may change in the future as we’re working on an improved version. 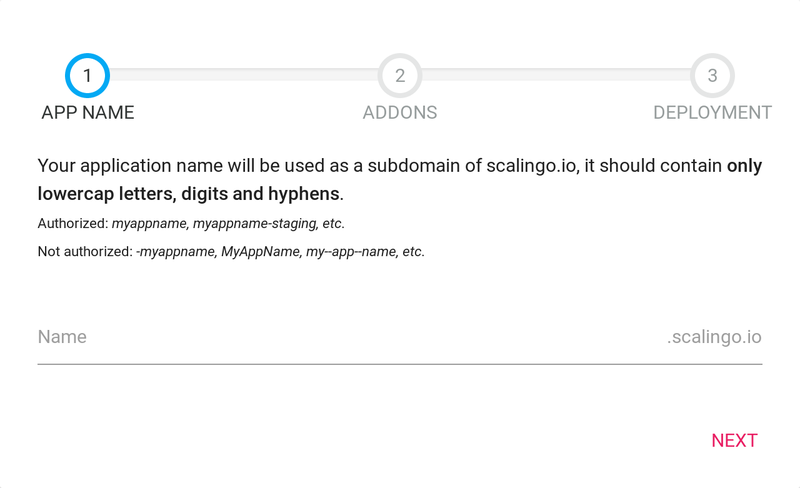 While it’s perfectly possible for a single application hosted on Scalingo to define 2 different process types that will handle web and TCP traffic, it’s not possible to handle both traffic by the same process. 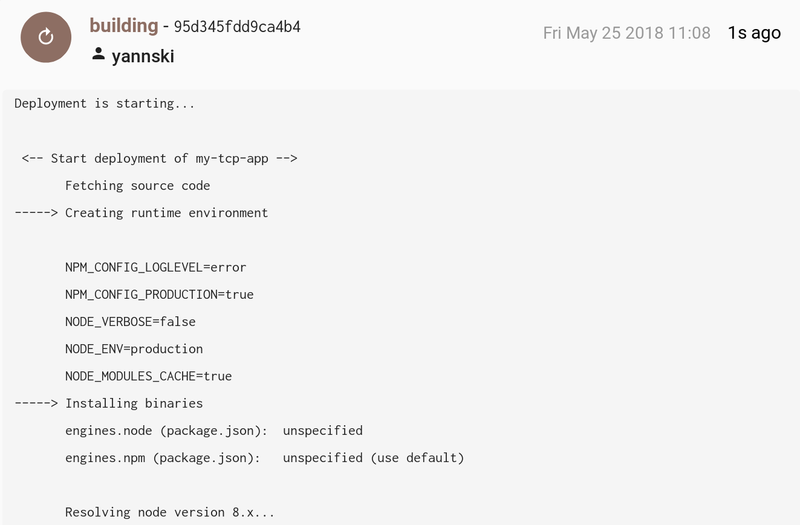 Indeed, by defining both web and tcp lines in the Procfile of your app, this will results in two different process types started by Scalingo. Each process type can be handled separately: you can start, stop, scale each one. For example, you can have 10 tcp processes of size S and only 1 web process of size M.
However, it questions web/tcp inter-communications. To answer this problem you will certainly have to use a database acting as a middle man. The incoming TCP requests will be handled by your TCP processes, they will extract and store any valuable data in a database. Your web processes will then be able to query this database. Fortunately, Scalingo provides MongoDB, Redis and InfluxDB hosting that can do this job. While it’s a little pain for some developers, it will really help you scale your app horizontally. While there’s no rate limit yet we may introduce one in the future though. Mosca is a NodeJS MQTT broker which can be used as a standalone app or embedded in another NodeJS application. Here is the source code of this sample. 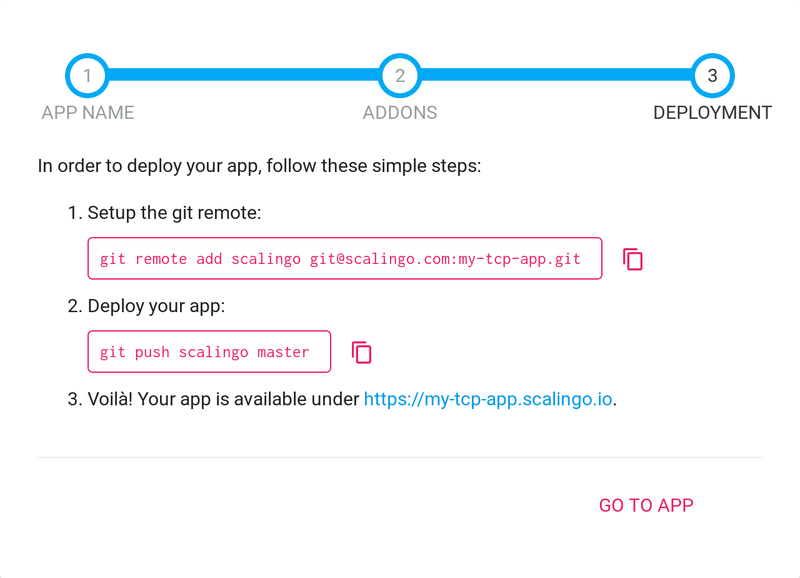 With this new addition, Scalingo becomes the first Platform as a Service to officially support TCP applications. In fact, we support any app, be it a web app or an IoT app.